Suspend SC Kills ants, centipedes, firebrats, gnats, midges, millipedes, pantry pests, silverfish, bees, bedbugs, carpet beetles, cockroaches, crickets, fleas, lice, flies, hornets, killer bees, mosquitos, pillbugs, scorpions, sowbugs, spiders, ticks, yellow jackets, wasps, termites (including formosan), carpenter ants, and more!. Use Suspend SC safely even in Federally inspected meat and poultry plants. 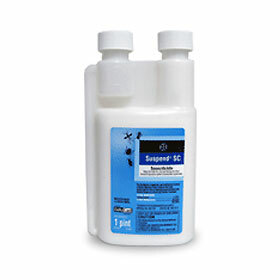 Suspend Insecticide leaves NO odor behind! It delivers an extra 90 - 120 day residual effect indoors! Would you like to see the Suspend SC MSDS sheet? How about the Suspend SC Label?